Oh yeah. Its really rock solid. Cumberbatch really nails the character. SOLD After three episodes now. It’s really getting its footing and has turned into a pretty interesting show. Very creepy at times and the murder/mystery takes a back seat to the ‘mystery’ of Amy Adams character. Yeah, this show is becoming addicting for me too. The character of Camille gets a lot of criticism around the web, but I'm loving the overall writing and acting of Amy. I just wish I could binge it rather than wait a week. Just started watching Castle Rock, first episode was interesting. I'm looking forward to catching up tomorrow. I finished the revival of Twin Peaks. I really enjoyed it but my god the balls on that man to end the series the way he did. Though it did leave me wanting more and I hope he has ideas for a season 4. Yeah, it's promising so far. I fell in love with the show at the first episode. Watson: "Well, I'd say you're a consultant but the police doesn't consult amateurs"
Holmes: (5 minute rant about every detail about Watson's life he correctly deduced by observing him. While Watson is amazed he adds) "See? you were right." Holmes: "The police doesn't consult amateurs"
1-Hour episodes on popular 1980's toy lines. The Star Wars and He Man episodes were pretty good. Haven't checked out any of the others (GI Joe, Transformers, Barbie), but it's fun to see how some of my favorite toys as kids were created. Finished binging Darling in the Franxx a few days ago. First half of the series is kinda eh, some typical mecha anime stuff. The second half (starting around episode 13ish) gets REALLY good. The characters really grip you, and the Hiro/Zero Two romance is one of my favorite TV romances ever. Second half is a huge tearjerker too. Outside of that, I'm casually meandering through iZombie and season 4 of Sherlock. iZombie is probably the funniest show I've seen since Scrubs, but the overarching plot isn't really binge worthy imo. Good in small doses. Sherlock is... Sherlock. The episodes are basically movies so I just watch one when the mood strikes. Also keeping up with My Hero Academia and Attack on Titan since those are back on the air. Anyone else watch 'ALONE' on History channel? My boys and I love to watch it. It's a pretty interesting concept. (10) contestants start....they get to choose (10) survival items from a list (and are given a couple additional by the show) then they are dropped off in a remote location.....have to film themselves 'surviving'. No help. No one around. Just them. When they feel like they can't go on they use a satellite phone they are provided and 'tap out'. The contestants never know when others tap out and/or how many remain. Last one to tap gets $500k. It's pretty neat. Not 'enthralling' action but it's just neat to see how people deal with being isolated and how different people go about 'surviving'. There's been (5) seasons and without spoiling too much there hasn't been a contestant to make it past 100 days. I remember watching that show a couple years back. I remember liking it but I think that there were too many other shows on and I couldn't fit them all in, so I faded away from it. I'll give it another try. I watched the premier episode of 'Lodge 49' on AMC. It was pretty interesting....and seems like it could be a neat show. Just started Castle Rock and will be starting Fargo season 3 this week too. My boss told me about this a while ago and I finally started watching. Take Silvio Dante from The Sopranos and drop him in Norway and this is what you get - even though it's a different character and story. So far, it's absolutely hilarious. It is a solid show. That isn’t out of the question either. Makes perfect sense actually. Only thing that could mess up that theory is that when the detective did the test on pulling teeth out he could not do it. So I am inclined to think her mother isn't the killer. Whats great about the series, besides the storyline and acting is that, here we are still guesing with only 2 episodes left. This last episode 6 was the best by far. The subtle hints. aka the sisters ear etc, are just enough to through you out there. Yeah....this last episode really cranked up the intrigue and suspicion. I really like how they handle Camille's flashback sequences...how they piece them into the moment she finds herself in. So well done. I get the pulling teeth thing being 'too hard' for a woman to do.....but at the same time that very well could be a Red Herring situation to throw you off the scent of it being a woman? I agree that the fact there is no clear front runner as far as who the killer is with only two episodes left is a sign of good writing. I'm under the assumption the killer will be a character we've seen and met and not just a 'random' person. That'd be fairly disappointing at this point. The 5th Season of 'The 100' hit Netflix so I watched the first 5 episodes last night. I know it's a CW show and all....but I really like it. It's a guilty pleasure type show yet at the same time I think they've done a good job of keeping the story evolving and interesting. Anyone else watch this show? The first few seasons of season 1 I think are pretty poor, but other than that I really enjoyed the first two seasons. It's definitely a CW show, because they ride the 'forced drama because no one can ever get along with anyone else for more than two seconds' train pretty hard, but there's some really great stuff there. The ending to season 2 (which I won't spoil) in particular I think is genuinely one of the best things I've seen on TV. I sort of lost interest sometime in the third season though, when it seemed like they tried to drive that train through the station one too many times and all the characters starting making stupid decisions and regressing in their development. Might just be me, though. I know lots of people still watch and enjoy the show, and who knows, maybe seasons 4 and 5 are better. I had never heard of it until I discovered it on Netflix a couple years ago. At the time there were (3) seasons ready to watch so I binged it in a week or so. Then, I've just waited for season 4 and 5 to hit Netflix. I agree that they manufacture some small drama between characters just to have it but all in all they've ran a pretty cool story....it could have easily 'dried up' considering the limitations that 'world' has to offer....but they've kept it interesting enough for me to keep up with it. It's not Game of Thrones by any means but I've watched much....much worse. 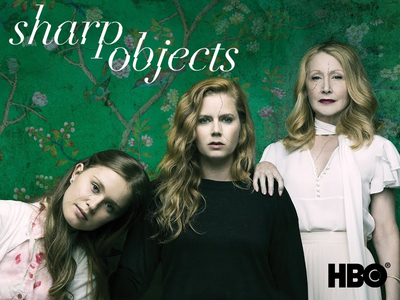 Sharp Objects keeps stepping it up. WOW. Beautifully done series. I still need to watch last nights episode....didn't get the chance to. 12 Monkeys and Castle Rock. And some G.L.O.W. Dang....got to watch it.....Man, this is a good show!! I loved the book and thought the show started slow but I wanted to stick with it because I knew it should get better and it certainly did. I haven't watched the latest episode but I expect it and the finale to be fantastic and a bit jaw dropping. I was able to download Sundays episode before heading out to Europe, but I'll have to wait till I get home to finish off the show. Holy cow......crazy finale! I had a feeling there’d be a curve ball and man was there! Recently started watching The Handmaids Tale with my girlfriend. It's interesting how the show makes me super interested in keep watching it yet makes me so disgusted at the same time. 3 episodes in. I thought it would be better, but I'll stick with it. Anytime anything interesting is about to happen, the extremely annoying mother shows up and is like "you are embarrassing the family". It gets old. I'm two episodes into Altered Carbon! Just started watching The sinner with jessica biel on netflix. So far, its really good.